Jack Sparrow, Alice Cullen, Bella Swan, Joan Jett, Cherie Currie, The Joker, Harley Quinn, Sweeney Todd and William Turner — Hannah Hindi, 24, and Hillary Hindi, 20, of “The Hillywood Show” online have played them all and more in their online parodies that have arrested the humor of millions. Hannah (Alice Cullen in the parodies) and Hilly (Bella Swan) are the official hosts of the Twilight Conventions. With Jacob Jost (Edward Cullen), Drew Lorentz (Jasper Hale), Shuan Flynn (Emmett Cullen), Brittany Turner (Rosalie Hale) and Joseph Lewellyn (Jacob Black), they tour the country in costumes and makeup so precise that it’s hard to believe it’s all done by a couple people. It all started three years ago when Hilly entered AOL’s “Be a Red Star” contest and came in third out of nearly 100,000 video entries. “People that voted for us became fans and they said, ‘Keep going; this is a really funny idea,’ and we’re still doing it today,” Hilly said. The girls decided to continue on with “The Hillywood Show,” and 15 webisodes and several film parodies later, the show is an online hit. About a year and a half ago, their Twilight parody was released; and the show’s ratings skyrocketed. The nine minute Twilight music video parody has over 4.275 million hits. Both girls have a strong background in dance, and they use this talent as well as an abundance of creativity, wit and hard work to create amazingly entertaining parodies of blockbuster films. “It (The Twilight parody) did everything for us,” Hilly said. “Before it we only had 50,000 views for our most hit video and that was online for about a year. But for Twilight – in a day it had over 100,000 views. “It was definitely an eye-opener that we had to keep pursuing this,” Hilly exclaimed. The highly anticipated Eclipse parody will be released in November. “That doesn’t mean November first though,” Hannah said with a laugh. The parody will be around ten minutes. A few teaser photos have been released. “It’s going to include the meadow scene, the tent scene and a lot of the other iconic scenes. It’ll be great,” Hilly revealed. “And it’s a lot more parodying and funny this time, we cans say that too,” Hannah added. All of their footage is shot with only one camera. The parodies and episodes are written, directed, edited and produced by the sisters. The parodies are funded primarily through donations and merchandise sales. “We think of an idea then we start scripting it in our heads,” Hannah explained. “We have these really cool ideas, but then we have to ask can we afford this? Is it in our budget, which is like nothing.” Both girls laughed. The Twilight parody cost around $1,200 to produce, New Moon cost $10,000 and Eclipse will cost $20-25,000 by the time it’s done. After scripting, make-up tests, casting, prop hunting and location scouting, it takes about two weeks to film a parody — if everything goes well. Then it’s editing time, which takes another two weeks. The girls have also parodied Dark Knight and The Runaways. So what would they like to parody next? “Alice in Wonderland,” they answered together. But who would play Alice? “We don’t know,” Hilly and Hannah answered together again. “But we definitely want to do that parody,” Hilly added. The large-scale dances, detailed wardrobe and makeup, smooth and artistic camera shots, humorous scripts and perfect casting are all done by these two sisters. But who does what? Hannah shoots most of the footage and handles organization including getting props, schedules and actors together. Hilly does all of the video editing and graphics for the website and show. The girls have an equal hand in casting, makeup, costuming and scripting. The pair was born and raised in Las Vegas, where all of their footage has been filmed except their New Moon parody, which was filmed in Forks, WA – the setting of the Twilight films and books. “It was really, really cool because that was our first out of town shoot,” Hannah said. Bella Swan has been Hilly’s favorite character to play so far. “Only because all the past roles I have done have been male characters; so being able to able to play a girl makes me feel good,” she laughed. As for Hannah, her favorite character to play has been Mrs. Lovett from Sweeney Todd, who is featured in The Hillywood Show. While the pair is currently focusing on their parodies, particularly Twilight, their web-series is where it all began and has a special place in their hearts. Captain Jack Sparrow is a star character of the show, as are a few other Johnny Depp characters. “Our main objective is to get The Hillywood Show on television with a network,” Hilly said. The pair wants to create a “Saturday Night Live” for teens. The duo is no stranger to performing. Hannah has been dancing for 17 years and teaching dance for 13 years, according to The Hillywood Show website. She has taken ballet, pointe, jazz, tap and hip-hop. Hilly has been dancing for 15 years. She has taken ballet, pointe, tap, jazz and hip-hop as well. The sisters are busy touring and finishing up their Eclipse parody now. While their fame is growing and their talents are plentiful, they’ve managed to remain incredibly humble. I love the Hillywood show and their parodies are AMAZING. They work so hard and their end products are Fantrastic. I can’t wait till the Eclipse parody comes out. Hilly and Hannah Hindi put so much hard work, effort and dedictaion into their work, along with the other cast members. The costumes, sets and make-up are so exact to the original. I can’t say anything bad about them, their just 2 people who like to entertain people by doing what they love! You should know that ONLY Hillary, Hannah, Drew, Jacob and Kyle Dayton (Jacob Black) tour. did you what to the hillywood show tour? i love the hillywood show. 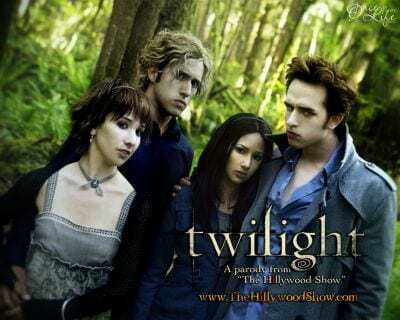 who do you like in the twilight saga by the hillywood show?